Dr. David Samadi, Prostate Cancer Lenox Hill (New York) - Book Appointment Online! 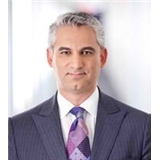 Dr. Samadi is world renowned prostate cancer and Men's Health Expert. He is also board certified urologic oncologist trained in open traditional and laparoscopic surgery and is an expert in robotic prostate surgery. He is the Chairman, Department of Urology, and Chief of Robotics at the Lenox Hill Hospital in New York City. He has dedicated his distinguished career to the early detection, diagnosis and treatment of prostate cancer and is considered one of the most prominent surgeons in his field. His expertise is in prostate health, elevated PSA, enlarged prostate, MRI Fusion Biopsy and prostate cancer.